Glen Burnie, Maryland is located in Anne Arundel County, Maryland and is considered a suburb of Baltimore City. Leonard R. Stamm represents individuals charged in Glen Burnie, Maryland with driving under the influence (DUI) and driving while impaired (DWI) by alcohol, and has been doing so for over 30 years. It is important to select a lawyer with expertise and experience to have the best chance of obtaining the best possible result. 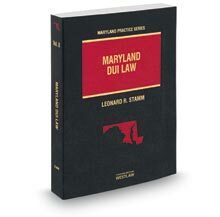 Leonard R. Stamm is the author of the authoritative treatise on Drunk Driving Law in Maryland, Maryland DUI Law, published by West-Thomson-Reuters. He has been training other lawyers how to defend DUI cases since 1986, and currently conducts training on a regular basis to public defenders in Maryland. He is a former president of the Maryland Criminal Defense Attorneys' Association, and is currently the Dean of the National College for DUI Defense. (Click here to read and watch a video of his Dean's Address). He also is a former chairperson of the National College's amicus committee and has helped to submit amicus briefs to the United States Supreme Court in Bullcoming v. New Mexico and Missouri v. McNeely. He has received the highest possible rating from Martindale Hubbell, AV-Preeminent, is recognized as a Super Lawyer, and a Best Lawyer, and has received a rating of "10 Superb" from Avvo. DUI law is one of the most complex areas of the law. A lawyer must be familiar with the laws and regulations governing Motor Vehicle Administration hearings and all aspects of a DUI investigation. All elements of the case must be reviewed, from the basis for the stop, to the reason the officer had the driver exit the car to perform field sobriety tests, to the administration, performance, and interpretation of NHTSA's standardized field sobriety tests, the decision to arrest, and compliance with all aspects of the breath or blood test procedures. In court, or at an MVA hearing, a lawyer can challenge the officer's adherence to standards or failure to investigate other explanations for observations that might seem to indicate impairment. Whether the case will go to trial or result in a guilty plea should be discussed with the client. In Glen Burnie, there is normally no "trial penalty." In other words, if a prosecutor offers a plea to a "b" (driving while impaired) and a "PBJ" (probation before judgment), this result can often be obtained after a trial which results in a guilty finding. With probation before judgment, although there is no conviction or points, the record remains forever, and cannot be expunged. So in most cases, there is no downside to taking a case to trial. Unfortunately, most lawyers in Glen Burnie assume the case is too difficult to win in court or at the MVA and fail to challenge the State's case. Some lawyers never challenge the State's case. This can be a huge mistake since most DUI cases have issues that can be raised in defense, and with zero or very minimal penalty. In other words, the result of fighting and losing is rarely worse than just pleading guilty or not requesting a hearing at the MVA. So why would you want to choose a lawyer who will not fight your case? When interviewing a lawyer, you should ask if your lawyer intends to fight the case, and if not, why not. We represent clients that have been pulled over for DUI or DWI or some form of drunk driving or driving while impaired charges by Maryland State Police, Anne Arundel County Police, Maryland Transportation Authority Police in Glen Burnie, Maryland. Be represented by the criminal lawyer who wrote the book on Maryland DUI Law, literally. If you need to be defended or represented for a drunk driving arrest in Glen Burnie, Maryland, call 301-345-0122 or click here to submit an online form for a free consultation.